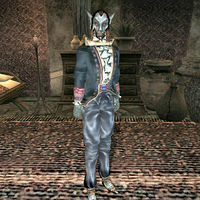 Direr Arano is a Dunmer noble of House Hlaalu and owner of the Arano Plantation, a small plantation in the Ascadian Isles growing marshmerrow, corkbulb, saltrice and other staple products. He can be found inside his small manor. He is one of the lesser nobles of House Hlaalu, and his humble estate is not much compared to the Dren, Arvel and Ules plantations. Still, affairs seems to be going relatively well, and he is the only Hlaalu plantation owner not to utilize slave labor. Direr wears an extravagant shirt with matching pants and a pair of expensive shoes with a matching ring. In addition, he carries an iron dagger and 38 gold. Aside from his natural resistance to fire and the sanctuary provided by his ancestors, he knows no spells. This page was last modified on 7 April 2014, at 14:48.